You are here: Home / Coffee Beans / How Are Coffee Beans Processed? How Are Coffee Beans Processed? How a coffee bean is processed impacts greatly on the quality and flavour of the final cup of coffee. To fully appreciate the complexity of coffee bean processing, we first need to understand the structure of the coffee bean itself. The outer layer of the fruit containing the coffee seeds resembles the flesh of a plumb or the typical cherry. In case of the coffee fruit, it is referred to as the ‘pulp’ and not flesh as in the case of these other fruits. Beneath this lies what is referred to as the mucilage, a sugary sticky substance that encases the seeds (1). Due to its sweet flavour and gummy texture, it is at times called honey. Next to the seeds, and under the mucilage is a layer of cellulose, which when dried resembles parchment paper, thus it is called parchment. The last layer before reaching the seeds themselves is a very thin coating known as the silver skin, called this because it gives off a silver-like shine. This layer is removed during roasting. Finally, protected in the innermost part of the fruit are the two seeds in every fruit. Roughly 5% of the fruit contain only a single small round seed, and the coffee obtained from such seeds is graded peaberry. The processing of coffee beans starts immediately after harvesting of the crop. In the first part of processing, the beans have to be separated from the rest of the fruit. This can be done by employing one of two methods. Also known as the natural or unwashed method, this is the simplest, oldest and a cheaper method of processing coffee beans. It involves drying of the fruit on spacious surfaces in open air for approximately three to four weeks. During the drying period the cherries are turned repeatedly to avert fermentation. Unfortunately, the process allows fragrances to escape in addition to allowing sugary substances form the pulp to seep into the bean. This produces a milder cup of coffee that is not as aromatic as a cup of coffee produced using some other processing methods. The first step in the process is to sort and clean the ripe cherries from the under and over ripe or damaged ones. This is done by hand using a large sieve-like instrument. The cleaned cherries are spread on concrete or brick foundations and at times on elevated matting. The fruit is dried until it only has a maximum of 12.5% moisture. Sometimes plantations use drying machines to speed up the process. Drying is a critical step because over-dried fruit will produce brittle beans that break during hulling. Such beans are considered to be inferior in quality. Under-dried, moist beans are susceptible to bacterial and fungal attack. After drying, the parchment is stored in warehouses until it is ready to be hulled, meaning the beans are removed from the shell. The wet method of coffee processing cuts down on coffee’s bitterness and produces coffee with more intense aroma. The first step of this method is to bathe the fruit in water for 16 to 36 hours so it can swell and become and soft. 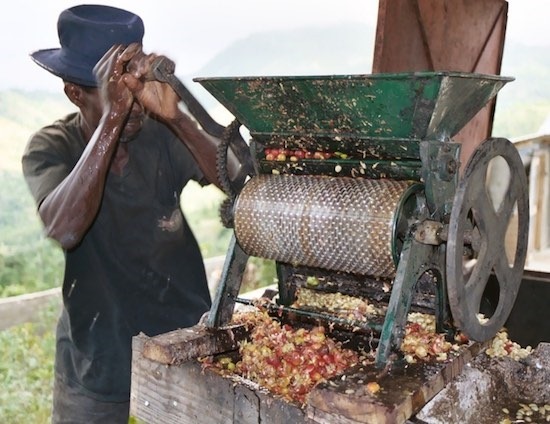 A machine called the pulper is then used to separate the seed from flesh of the fruit. The thin skin of sugary mucilage is left intact even after de-pulping. It has to be removed mechanically or through fermentation. Fermentation can be carried out in two ways. The beans can be allowed to ferment in their own juices or placed in tanks of clean water for six to 72 hours. This allows for the layer of mucilage that is still attached to the hull to be removed with ease. The mucilage is removed by washing the beans against a current of water. During this washing the ripest beans, being the heavier ones, settle to the bottom from where they are collected by the sorters, while the rest stay afloat. At this stage the coffee is commonly called parchment due to the presence of one last hull like covering still protecting the actual coffee beans (2). The parchment is allowed to dry in one of a number of ways, until the established 10% to 12% moisture content remains. 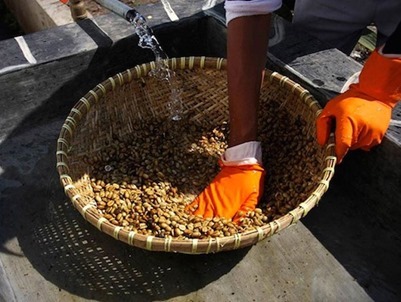 During this drying process, the coffee bean shrinks and separates from the hull-like covering, which is then easily removed using a dry miller allowing the green coffee beans to be retrieved. Honey prep is a fairly new way to process coffee beans being employed by some elite coffee farmers. It is a difficult process as it requires more work. The process begins by pulping the coffee, then immediately spreading the coffee for drying on patios without washing. Since some of the pulp is still on the bean, they have to be spread very thinly on especially designed drying beds, and the beans have to be turned every hour during the ten to fifteen days needed for drying. Based on the percentage of mucilage remaining on the seed, the coffee prepared in this manner is called 40, 60, 80 and 100% honey. To keep things in perspective, keep in mind that by removing the ‘honey’ intentionally, farmers can make the beans less sticky and cut down the risk of fermentation going sour while drying the beans. Some Costa Rican farmers prefer to ascribe colours like Black, Red or Yellow to their Honey processed coffee. The colours designate the amount of light the coffee bean is subjected to while it is being dried. Roasting is the last step in coffee processing, and it too plays a major role in the final taste of the coffee. The flavour of the coffee depends on the amount of time the bean is roasted. The longer the green coffee bean is roasted, the more intense the flavour, and lower the amount of caffeine that remains. Roasting is a skill that is achieved with practice as it requires the perfect temperature and timing to attain the desired mix of flavour and caffeine. While the latest packing techniques and materials ensure that pre-roasted coffee retains its flavour longer, many people prefer to roast coffee at home for the freshest possible tasting cup of coffee.